You don’t need a full-blown gym or even a single piece of equipment to get incredibly strong. The Progressive Calisthenics Certification imparts a lifetime’s worth of bodyweight exercises in just three short days. 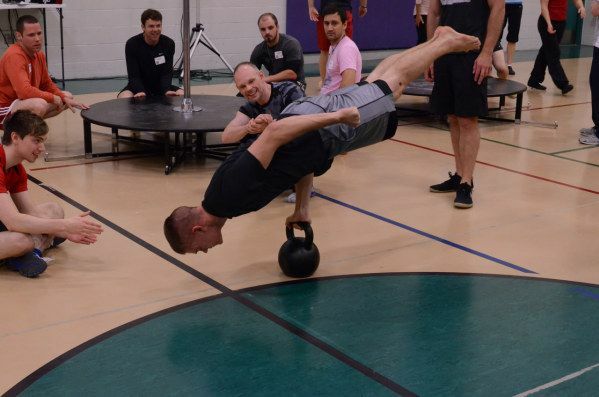 "I’ve got a strong arm…and a really strong arm," says Al Kavadlo, lead instructor of the Progressive Calisthenics Certification (PCC), to the group of nearly 60 rapt participants who have signed up for the three-day course in St. Paul, Minnesota. He means it as a shift in perspective, a way of considering your body’s abilities in a more positive light, but he isn’t joking. Over the course of the next three days, we witness feats of profound strength, hypnotic grace and acts of calisthenic derring-do normally relegated to grainy, jostling YouTube videos of muscle-bound men working out on playground equipment in urban environments. In fact, Kavadlo himself, along with his older brother, Danny, is the star of many such viral videos. The Kavadlo brothers have long been a staple in New York City’s Tompkins Square Park, where people come from all over to watch them work out — without using any of the equipment available in a gym setting. The Kavadlos are part of a movement back to minimalist fitness, using only the levers of your body — plus whatever sturdy implements happen to be on hand. Fair game: trucks, benches, railings, scaffolding, street signs, trees, and so on. "What I love about calisthenics is the simplicity and purity. As a culture, we have a tendency to think more is more, but that is not always the case," says Danny Kavadlo. "When I first became a trainer, I thought that there had to be a secret move or piece of equipment out there that the masses didn't know about yet, but I was wrong. As the years went by, I distanced myself from the equipment. The more Al and I learned about leverage, the less interested we were in weight stacks." 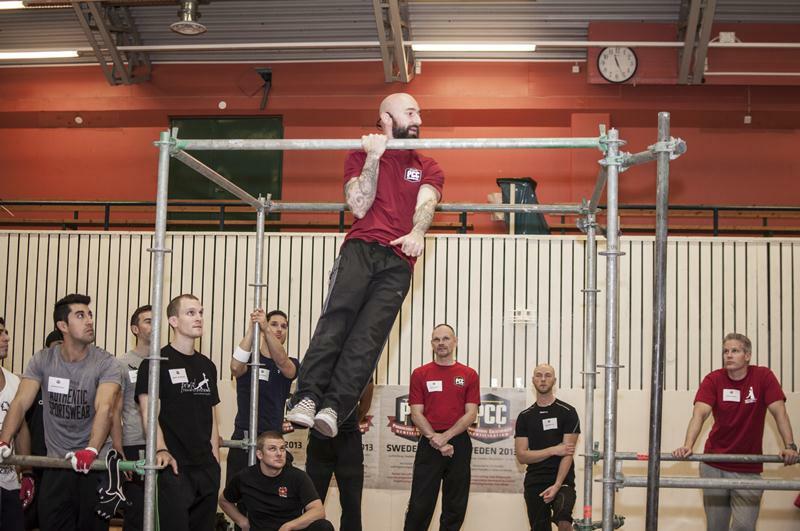 Recently, the brothers have taken their show on the road, presenting Convict Conditioning author Paul Wade’s bodyweight-training tactics in a structured workshop format not just in the States, but also in places like Sweden, Australia and Ireland. Sold on the convenient, do-anywhere approach to getting strong and shredded — not to mention the super-sweet party tricks, such as the human flag — participants are responding by packing the house. The flow is the same regardless of location: three full days of skills, followed by the potentially daunting "Century Test," which consists of 100 total reps of squats, pushups, hanging knee raises and pull-ups in under eight minutes. Participants must pass it in order to be deemed a PCC instructor, and not everyone does (though, as with other Dragon Door certifications, there is an option to send in videographic evidence of completion later). Assisting the Kavadlos at these workshops is a growing number of PCC instructors, including Senior PCC, Stephen Low, author of the Amazon bestseller Overcoming Gravity, and PCC Team Leaders Adrienne Harvey, Beth Andrews, Angelo Gala and Logan Christopher. Each of them is strong in his or her own right, and they elicit oohs and ahhs from us as they demonstrate even difficult drills with ease. The instructors’ skills are impressive, to be sure, but so are many of the participants’ abilities, as new skills are developed rapidly under intense tutelage. In my group is Phil Ross, owner of American Eagle MMA & Kettlebells in Ho-Ho-Kus, N.J., and my training partner and I grumble as we watch him perform increasingly difficult pushup variations with apparent ease. "Who invited that guy?" we joke, but in truth, the vibe of the group is highly supportive. We clap for each other each time we accomplish something new, and the din during the Century Test the last day is deafening — and uplifting. "This group of people, some with sports backgrounds and many not, all came there to learn something new," says Kelly Stranahan, personal trainer at DKB Fitness in Santa Fe, N.M., who learned to do a one-armed handstand and a one-armed elbow lever that weekend. "It was so beautiful to see such camaraderie in such a diverse group." Calisthenics draws a broad crowd. 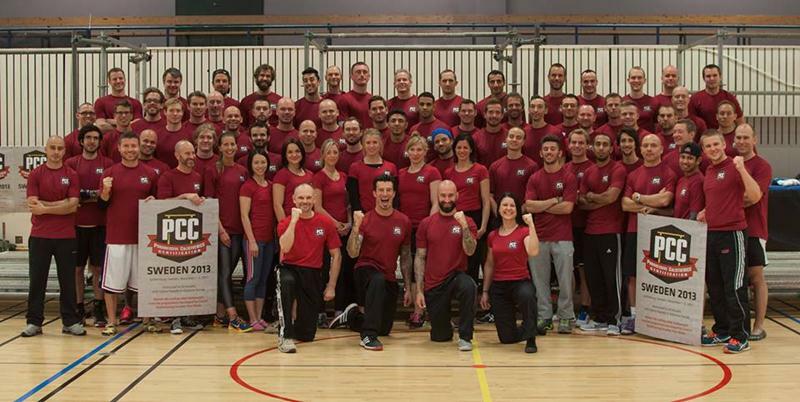 Though many workshop participants know each other from Dragon Door’s kettlebell-training community, the PCC also attracts traceurs from the parkour and freerunning community, along with yogis, peripherally curious fitness newbies and strongman types. The allure? Calisthenics is "true movement in its most basic, fluid, and beautiful form," says Brendan McCormack, senior at the Minnesota State University: Mankato and parkour enthusiast. "I gladly would’ve gone pretty much anywhere for this event." During lecture portions, Danny Kavadlo serves as an accidental foil to his more serious, mellow younger brother. He is pure animation, visually acting out what Al is saying in the background (much to the room’s delight), and piping in with the wisdom of his own experience with a pronounced Brooklyn accent. The mood remains jovial even as participants concentrate on getting the hang — sometimes literally — of new skills. Pleasingly, everyone in the room seems to find something they’re good at, and plenty more to work on. For instance, Alby Owens, a personal trainer out of Australia, proves to be a headstand master, picking up new skills in that domain readily ("Look, Ma, no hands! "), but when it’s time for bridge variations, his lack of shoulder mobility limits him, for the time being. The PCC is based on four guiding principles: strength, versatility, minimalism and progression. And thus, by implication, regression, as well. The many exercise regressions embedded in the course material provide a low barrier to entry. "Anyone of any fitness level can jump in wherever is appropriate for them," says Al Kavadlo. "You don't have to be strong to start — you just have to be willing to put aside your ego and work hard." (He later qualifies the statement, saying that participants should be able to pass the Century Test in order to attend.) Steven Low estimates 70 percent of the clients he works with come to him with no prior experience with gymnastics-type movements. The process can be as simple as you make it. When the Kavadlo brothers started focusing on calisthenics over 20 years ago, they began with one exercise: pushups. Then they added pull-ups. "Over the years, we added more and more, but we never abandoned the basics," says Danny Kavadlo. 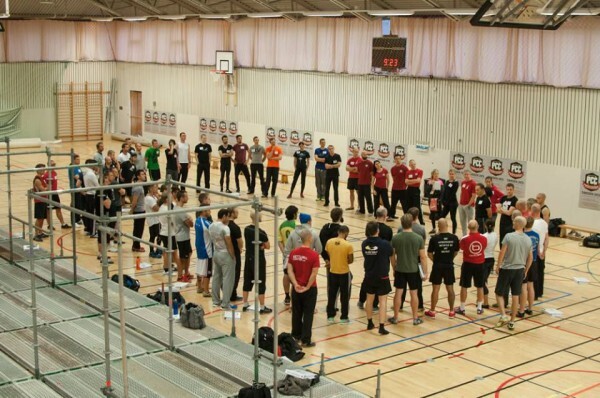 The PCC is constructed around 14 categories of movement, each of which gets its own module during the three-day course. Seven are classified as "dynamics" (pushups, pull-ups, handstand pushups, horizontal pull-ups, dips, leg raises and squat movements), seven are "statics" (press holds, midsection holds, bridge holds, handstands, back levers, front levers and side levers), and all provide a framework for full-body strength in every capacity. "Pull-ups are abdominal exercises," says Al Kavadlo. Lordosis, that common tendency toward a swayed back, inhibits the anterior core muscles’ ability to engage properly. The instructors teach us this flexed-ab, hollow-body position as we lie on our backs on the floor like so many dead bugs, arms and legs gently angled to the ceiling. Next, they have us hang from the bar in this manner before progressing to various more difficult maneuvers. Sure enough, the next day my midsection is slightly tender to the touch. Including "progressions and regressions", the PCC Instructor's 626-page manual includes nearly 70 vertical pull-up variations, with the key 16 of these exercises being fully illustrated, the toughest of which is a one-armed number. 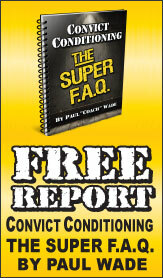 "If you can do 15 consecutive two-armed pull-ups, you can start transitioning to a one-armed pull-up," says Al Kavadlo. This is a theme of the weekend: All the instructors emphasize progressing slowly, within your limits, and although participants do attempt daring maneuvers, the pace of each day is quite manageable — slow even, but necessarily so, considering how physically taxing some of the exercises are. "I like to call these ‘assistols,’" Al Kavadlo jokes as he grips a pole (to be clear, they are dancing poles, and plenty of jokes are cracked) while performing a body-weight pistol squat. From there, the situation escalates quickly, with increasingly difficult squat variations being introduced. During the pushup module, Danny Kavadlo demonstrates pushups on four fingertips per hand, then three, two, and…one. This occurs with each of the 14 main categories of movement, the instructors taking us far beyond the first stage, to as far as we’re able to safely go. "The beauty of the PCC is the progressions and regressions. I can go back to basics while rehabbing without worrying about getting set too far back," says Dave Clancy, who is prepping for a shoulder surgery. "I will be challenged yet not killed by the exercises." Clancy goes on to perform a full handstand on the handles of kettlebells later in the weekend — and lives to tell about it. The PCC version of a "hook grip" involves wedging your thumb against the rest of your fingers to bolster hand strength. When I ask about the potential confusion between that and the Olympic weightlifting hand position of the same name, Al Kavadlo replies: "Movement is movement. People are going to use different terminology in different schools of movement." In other words, he is not interested in a debate about labels — it’s all under the same umbrella. The decidedly calm, balanced energy he brings to every element of his coaching style is no accident. A practitioner of Zen Buddhism and meditation for a decade, he has cultivated these qualities intentionally over time. It should not be surprising, then, that the entire curriculum is presented without dogma or demand — participants are encouraged to experiment with form variations that feel good to them. This is a welcome departure for many in attendance, who comment how unlike the PCC is in this regard compared to other fitness certifications. But it makes sense, when you consider that each person’s body is going to have slightly (or even dramatically) different leverages and weight distributions. The "square peg, round hole" tactic of assigning everyone identical form without giving thought to such differences does not apply here. "What’s best for you may not be what’s best for me and vice versa," says Al Kavadlo. "The steps you take may not always be linear," he continues. "I’m from New York, and a visitor might ask you how to get to Central Park. And it’s like, ‘Well, you can take the Q train, a different train, you can walk, you can take a taxi. All of them will get you to Central Park.’" Most of his answers to participants’ questions essentially boil down to, "If it works for you, do it." As Kavadlo points out, it doesn’t matter how you get there, as long as you are willing to go. "I love helping people tap into their potential — it's great to be able to motivate clients to achieve things they once thought were impossible," he says. "The carryover between physical strength, and the way it leads to a stronger mental attitude is also a wonderful thing to behold." The instructors aim to provide us with an arsenal of new tools and plenty of ideas for how to improve. And, although we learn plenty of techniques that increase our success rate at each skill, at the heart of it all is hard work. 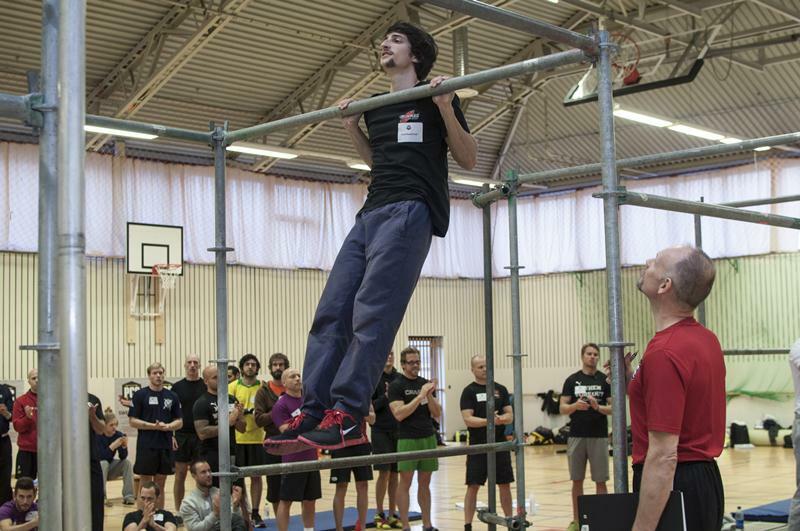 "Everyone always wants to know, ‘What’s the trick to doing a human flag?’" says Al Kavadlo. "There is no trick — you have to be really freakin’ strong!" Over the course of each day, new PRs are tallied up into the hundreds. "I nailed my first Back Lever at the PCC," says Sekou Olayinka, an educator and priest from Philadelphia. "I’d been training for it in the months leading up to it, but was unable to get it right before then. I also learned the clutch flag on both sides, did my first crow stands, a free-standing handstand and wall-walking bridges." Many attendees return home and share their new knowledge with others, Olayinka included. Marine LeAnn Splitter put a group of military students through their PCC paces, and Chain Reaction Fitness gym owner Benji Williford says he uses PCC progressions in every one of client sessions now. For his part, Clancy took his clients back to basics on pushups and pullups, slowing them down to really dial in technique. "We have seen some new PRs in pressing since then," he adds. This is to be expected, it seems. "When you’re working on developing a new skill, you need to give all of your attention to the task at hand," says Al Kavadlo. "When you are completely focused on your training, the division between body and mind breaks down and everything else seems to fall away." For my part, I am more willing to road trip without a kettlebell, knowing I have plenty to keep myself fit…without bringing anything at all. "I love bodyweight training because it requires nothing more than your body, your mind and your warrior spirit," says Al Kavadlo. "You don’t need to buy anything, go anywhere or put on any special clothing — anybody can start right now." For Progressive Calisthenics Certification workshops in your area, click here. Jen Sinkler, PCC, RKC, PM, is a longtime fitness writer and editor. She trains clients at The Movement Minneapolis, and her website, Thrive, was recently named one of Shape magazine’s "Best Health and Fitness Sites for Women." Sign up for her fitness newsletter there, and follow her on Twitter @jensinkler.